BALTIMORE, Sept. 17, 2018 /PRNewswire/ -- The 33rd annual Natural Products Expo East, held September 12th-15th, is at the epicenter of consumer demand and innovation in food and beverage, personal care and home, and supplements and ingredients. Thoughts were on exhibitors and retailers directly impacted by Hurricane Florence as the industry gathered in Baltimore to unite and do business. This year, the show hosted more than 1,500 brands, including 244 first-time exhibitors. 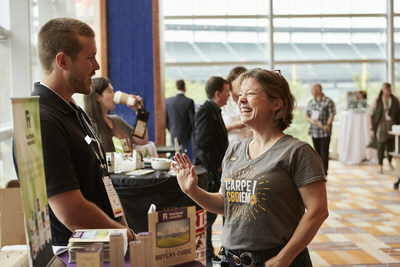 Education sessions and special events were held throughout the convention center and nearby hotels during the week, creating opportunities for the community to come together and make connections that will continue to lift the industry as a whole. "We would like to thank all of the attendees and exhibitors who came out to Expo East this year in spite of the early week weather forecast. While our hearts go out to everyone impacted by Hurricane Florence, the passion and commitment of our industry weren't dampened by the potential effects in Baltimore. We saw much excitement and enthusiasm in the halls as brands showcased new products supporting health, sustainability and important missions. Every single person who walks through the doors at Expo East each year has the potential to impact change and help bring more health to more people now and in the future," said Adam Andersen, Senior Vice President, Events, New Hope Network. The U.S. natural products industry grew 6.3% to hit $206 billion in annual sales last year, and industry sales have been more than doubling since 2007, according to New Hope Network's Nutrition Business Journal. The combined U.S. sales of natural, organic and functional foods and beverages increased 6.5% to $143 billion in 2017. This growth was about 10 times that of the overall $280 billion total food industry, which saw another stagnant year of about 0.7% growth. 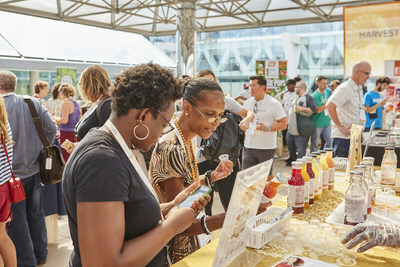 Much of the growth in natural products comes as a result of entrepreneurial brands bringing innovative ideas and new flavors to the table and the expo floor. Ibraheem Basir, Founder and CEO of A Dozen Cousins, said: "We think there is a huge opportunity to bring some fun and innovation to the bean category. Prior to Expo East, only a small handful of people had heard our story and tried our products, so it's been really exciting to share our brand with so many people and to get such positive feedback." The brands showcasing ground-breaking innovative products each fall at Expo East are using their growing might to create positive disruption in the consumer goods marketplace. The content and research team at New Hope Network tracked nine trends this year. For detailed descriptions and examples of exciting new products that exemplify each trend, visit the online gallery at newhope.com. The conference featured a robust education program including The Big Ideas in Organic, a powerful discussion of the innovations that will drive the next decade of organic industry growth and influence featuring a keynote by Karen Washington, co-owner and farmer at Rise & Root Farm. The organic industry has been at the heart of natural products since the industry was formed and highlighting organic's growth and potential was an important theme throughout the show in education, special events and at booths of large and small organic brands. According to Lewis Goldstein, Vice President Brand Marketing, Organic Valley: "Each year we bring a bit of the farm to Expo East, and share what being a farmer-owned cooperative really means. We take our role in the industry seriously, and come together to support our retailers and customers." Additional 2018 Expo East education highlights included the Hemp & CBD Summit, a closer look at the hottest product in supplement aisles; the Disrupted Retail Summit, a discussion around the changing consumer purchasing habits and opportunities at retail and online; and the Climate Action Summit, featuring a keynote by Jerry Taylor of the Niskanen Center. The winner of Natural Products Business School's Pitch Slam was Something Better Foods, founded by Chef GW Chew. This year, a new NEXTY Consumer Choice Award category was added and included at-home judging by 1,000 health-focused consumers. The winners were Charlotte's Web's CW Hemp Plus, Primal Kitchen's Organic Unsweetened Ketchup and WaterWipes baby wipes. A full list of the winners of the 2018 NEXTY Awards, representing what tomorrow's healthy living landscape will look like, can be found online. Natural Products Expo East will continue at the Baltimore Convention Center September 11th-14th, 2019. Beginning in 2020, the show will relocate to Philadelphia. The 39th annual Natural Products Expo West will take place at the Anaheim Convention Center March 5th-9th, 2019, shifting exhibit hall dates to Thursday through Saturday in the Main Halls and Wednesday through Friday in the North Halls. New Hope Network will also host the fourth annual Esca Bona conference October 22nd-23rd, 2018 in Austin, TX. Esca Bona gathers together leaders in the industry to discuss how to shape a new path to create a good food future. For more details visit EscaBona.com. Natural Products Expo East is produced by New Hope Network and is co-located at the Baltimore Convention Center with All Things Organic/Biofach America, Natural Products Association East, and Harvest Festival. Follow @NatProdExpo and #ExpoEast on Twitter and Instagram, and visit us on Facebook for ongoing conversations.